There are several educational institutes that conduct online tests for their students on a regular basis. For this purpose, Addmen introduced the online test generation software which has been used by many reputed institutes as well as coaching classes. However, along with the online test software, most institutes also require an online question bank software with which they can create and maintain large number of questions online. So when the student comes online for a test, the software randomly selects questions from the bank and presents them to him or her. However, the concept of online bank software has some problems. As the questions can be of different types like pictures, diagrams, formulas, etc., you would require huge database space, and there may be a severe processing load on the server. You cannot edit the questions online. You will have to do it in the offline copy and then upload it again online. This is a lengthy and time taking process. Another problem is if each student receives a different question paper that has different types of questions, how can they be judged on the same parameters? In short, maintaining an online question bank software can cost you time, effort and money. 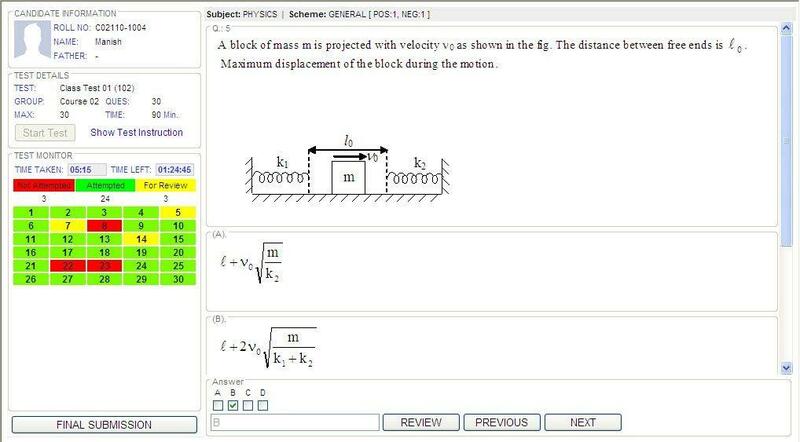 Hence, hough Addmen has an online exam software, it does not provide an online question paper generation software. On the other hand, you can use our offline question bank software and use it for generating online question papers. As the questions do not have to be randomly selected for every candidate from the online question bank, the load on the server is minimized quite considerably. You do not need to create different question papers for each student. The software automatically shuffles the questions and presents different sets of the same paper. With this question paper shuffling software, you can easily create multiple sets of the same paper, making the examination a fair process. Another feature of using the Addmen's online test and question bank software is that you can get access to readymade online test papers. We have been working with several coaching classes that train students for competitive exams like IIT JEE, CET, NEET, TET, CPT, IBPS, etc. They have shared several of their capabilities for providing online exam question papers with us. So, by joining Addmen, you get this benefit too.